Today I would like you to introduce you to two dachshunds named Stanley and Boodgie. I have never met them, but I have a book about them on the dachshund shelf here and I love looking at the pictures. Stanley and Boodgie were two handsome red dachshunds, and their person happened to be a famous painter. He loved them so much that he made an entire book about them. Their person was David Hockney. He was born in Great Britain, but now lives in Los Angeles. In the 1960's he painted in the Pop Art style. Momma loves his paintings - they are bright and full of color. Sometimes he paints dachshunds, like this book: David Hockney's Dog Days. "From September 1993, I painted and drew my dogs. This took a certain amount of planning, since dogs are generally not interested in Art (I say generally only because I have now come across a singing dog). Food and love dominate their lives. Here are a few pictures of Stanley and Boodgie for you to enjoy. They look very comfortable on the book cover! This dachshund, on the title page, is peeking. He's pretending to sleep, I think. I've heard of dogs who do this. Stanley and Boodgie look very comfy here on their big bed! Come to think of it, this book has lots of pictures of dachshunds sleeping. I like this book! Look at their little heads resting on the edge of the bed! There! Sometimes they eat, too. I wonder what was on that plate? And here is Mr. Hockney with his dachshunds, and with lots of paintings of them as well. Needless to say, I give this book four paws up! I recommend it highly for dachshund lovers and for anyone who loves dog art. It's still in print, so you can find it easily at your favorite book retailer. What do you think of the Hockney pictures? Do you think they capture dachshund personalities? 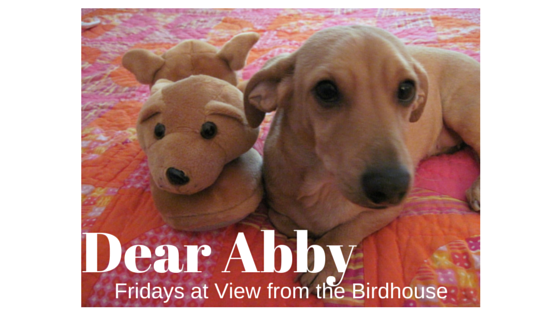 I would love to hear from you with thoughts or questions for future Dear Abby posts in the comments, below. How cute! I love dachshunds. I have had two chihuahua-dachshunds in my life and they are one of my favorite breeds! Thanks for visiting! Chiweenies are very, very cute. I stumbled across this book at a clearance sale at a local bookstore about 10 years ago. What a find. I love looking at how the artist's dachshunds have been pictured, and can see all of mine, over the years, in similar poses. This book makes me smile & feel happy. Who doesn't need a book like this in one's life? Abby, thanks for sharing this one. Please let us know what other treasures that you have on your dachshund book shelf. We would love to know about them so we can add to our own collection!